Back in December Tysonpower showed us how he was able to receive HRPT weather satellite images with a 80cm and 1.2m satellite dish, LNA and Airspy Mini. If you didn't already know, HRPT signals are a little different to the more commonly received NOAA APT or Meteor M2 LRPT images which most readers may be more familiar with. HRPT images are more difficult to receive as they are broadcast in the L-band at about 1.7 GHz and so receiving them requires a dish antenna (or high gain Yagi antenna), L-band dish feed, LNA and a high bandwidth SDR such as an Airspy Mini. The result is a high resolution and uncompressed image with several more color channels compared to APT and LRPT images. In the last video Tysonpower was successful with receiving HRPT images with his setup. But recently over on his YouTube channel and on his blog Tysonpower has shown how he has improved his HRPT reception by first optimizing the feed and adding in a copper matching line which helps improve the impedance matching of the feed. He also added an L-Band filter tuned to the HRPT signal which he notes made the biggest improvement, and he also moved all the components into a watertight box for permanent outdoor mounting. With these changes he's now able to consistently pull in some very nice imagery. All the images are still received by hand tracking the satellite dish as the satellite passes over, but he notes that he plans to experiment with motorized trackers in the future. Note that the video shown below is narrated in German, but English subtitles are provided if you turn on YouTube captions. A sample HRPT image received by Tysonpower. I found it quite complicated to find a decoder for HRPT when i started and there is still no one that you can just Download. The only free Decoder is the gr-noaa example in gnu radio that has a depricated wx GUI and uses a input from a specific SDR. I used that gr-noaa example and created a decoder that uses the modern QT GUI and has a clean interface. You just put in a wav IQ file from SDR# for example and it will decode the Data into the file you entered. It is not the best one out there in form of signal processing, but a good start i would say. The decoder can be downloaded from tynet.eu/hrpt-decoder. Below is a second YouTube video where Tysonpower explains how to use the decoder. Over on the SDRplay forums user 'RSP2user' has put up a quality post describing how he receives HRPT weather satellite images with his SDRplay RSP2. HRPT stands for 'High Resolution Picture Transmission' and provides a much higher resolution image compared to the APT weather satellite images typically downloaded from NOAA satellites. Somewhat confusingly the picture quality of HRPT is similar to LRPT (low rate picture transmission) which is used on the Russian Meteor M series weather satellite. HRPT provides 1.1 km resolution, whilst LRPT provides 1 km resolution. Currently there are multiple satellites broadcasting HRPT signals including NOAA 19, NOAA 18, NOAA 15, Meteor M2, Fengyun 3B, Fengyun 3C, Metop A and Metop B. The difference in difficulty of receiving APT and LRPT versus HRPT transmissions typically occur in the L-band at about 1.7 GHz, and requires a directive high gain antenna with tracking motor to track the satellite as it passes over. This makes these images many times more difficult to receive compared to APT and LRPT which only require a fixed position antenna for reception at the more forgiving 137 MHz. Over on his post RSP2user shows how he uses a repurposed Meade Instruments telescope tracking mount and controller to drive the tracking of a 26 element loop Yagi antenna. A 0.36dB noise figure LNA modified with bias tee input is used to boost the signal and reduce the noise figure. The signal is received by a SDRplay RSP2 and processed on a PC with USA-satcoms HRPT decoder software, which is available for purchase by directly contacting him. The HRPT signal bandwidth appears to be about 2.4 MHz so possibly an RTL-SDR could also be used, but it might be pushing it to the limit. If you are interested, RSP2user also uploaded an APT weather satellite image reception tutorial on another post. This tutorial shows how to build a quality quadrifilar helix antenna as well. Receiving the HRPT signal on USA-Satcoms' HRPT decoder. Over on his YouTube channel Adam 9A4QV has uploaded a video that shows him receiving the NOAA 19 HRPT signal at 1698 MHz with his HackRF, LNA4ALL and the simple circularly polarized cooking pot antenna that we saw in his last videos. HRPT stands for High Resolution Picture Transmission and is a digital protocol that is used on some satellites to transmit much higher resolution weather images when compared to the APT signal that most people are familiar with receiving. The HRPT signal is available on NOAA19, which also transmits APT. However, unlike APT which is at 137 MHz, HRPT is at 1698 MHz, and is typically a much weaker signal requiring a higher gain motorized tracking antenna. However in the video Adam shows that a simple cooking pot antenna used indoors is enough to receive the signal (weakly). The signal is probably not strong enough to achieve a decoded image, but perhaps some tweaks might improve the result. Over on his Reddit thread about the video Adam mentions that a 90cm dish, with a proper feed and two LNA4ALLs should be able to receive the HRPT signal easily. User devnulling also gives some very useful comments on how the software side could be set up if you were able to achieve a high enough SNR. 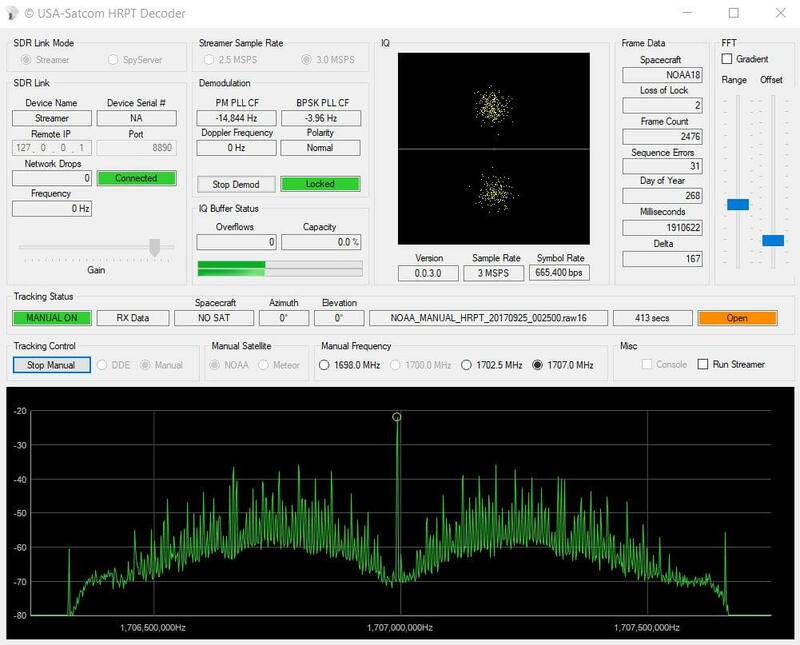 http://usa-satcom.com has a paid HRPT decoder that runs on windows that has some improvements for lower SNR locking and works very well. On a previous post we showed @uhf_satcom‘s HRPT results where he used a motorized tracking L-band antenna and HackRF to receive the signal. Some HRPT image examples can be found in that post.